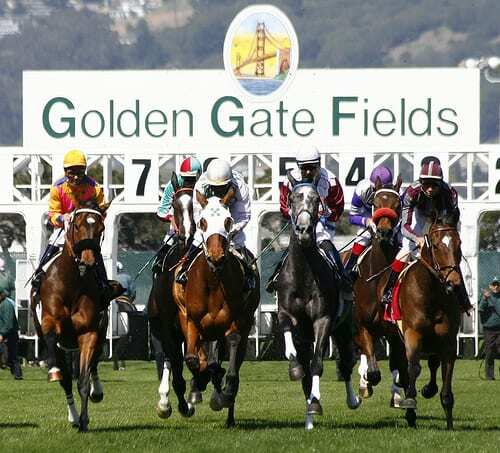 The Pacific Racing Association, which operates Golden Gate Fields in Albany, Calif., for The Stronach Group, has filed a lawsuit against the California Horse Racing Board in an effort to negate a law the CHRB says requires racetracks to contract with OTB facilities for simulcasting. At its last meeting, the CHRB approved Pacific Racing's license to operate an upcoming Aug. 22-Oct. 2 meeting contingent on contracts being in place with satellite facilities that are part of NOTWINC – Northern California Off-Track Wagering, Inc. NOTWINC was formed to administer simulcasting at multiple locations in the northern part of California and its members included the California Association of Racing Fairs, Thoroughbred Owners of California and privately owned racetracks like Golden Gate Fields. “We are seeking a court ruling invalidating that condition and give us the license without the requirement,” said Scott Daruty, a Stronach Group executive who serves as senior vice president or the Pacific Racing Association. Daruty said a key passage of the law says an OTB network “may” be operated by an organization like NOTWINC. While the Stronach Group sees the word “may” to mean contracting with NOTWINC as optional, the CHRB's legal counsel interprets the word to mean it is a requirement. The lawsuit was filed in Los Angeles Superior Court. “We're looking for a prelimary injunction, so it will be on an expedited basis,” said Daruty. The CHRB holds its next meeting July 12. OTB facilities are operated by county fairs. CLARIFICATION: An early version of this article said the CHRB required the Pacific Racing Association to contract with NOTWINC for simulcasting purposes in Northern California. The requirement, according to a CHRB spokesman, is to contract with the existing OTB facilities, Those facilities are members of NOTWINC, which administers simulcasting. This entry was posted in NL List, The Biz and tagged California Horse Racing Board, CHRB, golden gate fields, northern california offtrack wagering inc., northern california racing date, NOTWINC, pacific racing association, Scott Daruty, The Stronach Group by Ray Paulick. Bookmark the permalink.